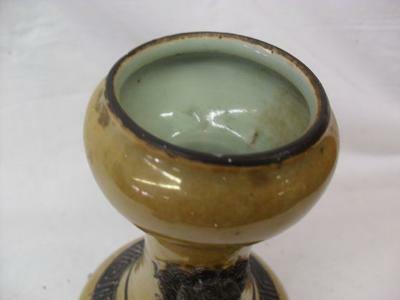 Qing Dynasty Vase – A Genuine Estate Sale Find? 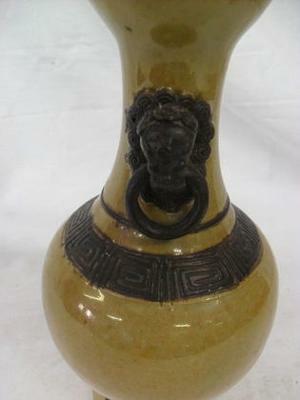 I bought this Qing Dynasty Vase at an estate sale a few years back. I was told it was an authentic Qing Dynasty piece, but is it a genuine estate sale find? 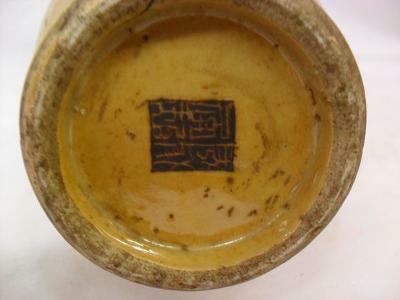 I have researched and was told the mark was correct for Qing although Qing dynasty is generally understood to be white pottery with blue or other colored designs. 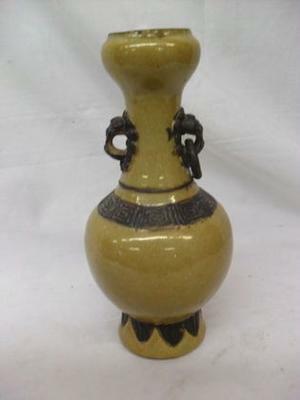 This Qing Dynasty Vase has a mustard glaze with brown bands and some swirled designs. The inside is a pale teal glaze. It also has two handles on the side and rings attached though one is missing. I would like to find out the value of this piece if possible or any other information. I guess the sale of the world’s most expensive vase intrigued you enough to pull it off your shelf, but Oh my God it is so ugly. This clearly is fake. Even the seal has no real characters.